I used Essie Mint Candy Apple as a base, with Nubar Milk Chocolate Creme over that with Konad Plate m60 for the argyle pattern. Konad plates are great when you're in a hurry, but still want a cool looking nail design, I love em, but wish they'd expand the line some. Love these! I'm such an argyle nerd! I love the Konad plates, but I always have so much trouble getting them to work! I'm obviously doing something wrong though, because you're like a pro at them! you probably get 4568853256 suggestions a day. but an idea? an infinity painting in your nails where your nails have small paintings of your hands and on those nails, painting of your hands and on those nails etc. etc. just a thought. ouah ! 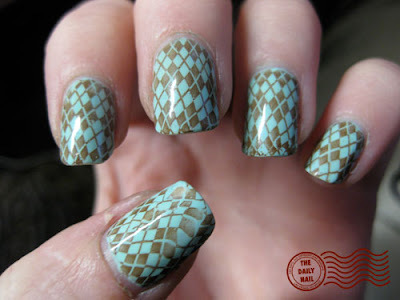 i just discovered your blog and what you are doing is almost like jewelry for nails.. amazing !! This one is very nice looking, and I especially like the colors. These must all take you a lot of time! I bet Lady Gaga would love you to work for her, and do her nails in all these cool designs! Frazer Huard- Thanks!! They don't take too much time, actually, usually between 30 minutes to an hour, an hour being for the crazy complex ones. I do it when I watch TV though, so the time flies by! lilmisshortee- that'd be such a cool job, you could do all sorts of crazy stuff- she pretty much has no limits! Emily- yeah, I saw that a couple of days ago, very cool, but not really my style. Some of the stuff they can do is amazing tho. Wow I love your nail designs very much, thanks for share. This design looks so incredible, indeed is one of the best of your designs honey, nice job honey. The hand is a woman's second face, and nails are the most to highlight its beauty .